In March 2016, I went on a five-day road trip with a close friend and my youngest sister through Glasgow and the Scottish Highlands. We hiked the Isle of Skye, rode horses around Loch Ness, and stumbled upon traditional folk music in small pubs. Planning a trip through the Highlands? Here’s our day-by-day itinerary and map. It was a jam-packed experience, but we wouldn’t have changed much. One possible alteration? Spend more time in Inverness or on the Isle of Skye than in Aviemore. It’s a cute vacation town, and we were there to have lunch on an old-fashion steam train that goes through the countryside. But if you’ve ridden a train before or don’t have children, it’s not a must-see. Still, the experience was nice for breaking up our long journey back to Glasgow. Below is a breakdown of what we did and where we stayed, along with a brief history of each town. Enjoy your digital journey through Scotland! We simply pulled over on the side of the road and starting walking through the picturesque fields. It was a pretty gloomy day, so we didn’t stray too far from the car. But if you’re looking for more guidance, here are some hiking trails in the area. This lush glen has a sordid past: Thirty-eight unarmed people from the MacDonald Clan were slaughtered by troops in 1692 because the MacDonald’s had not quickly pledged allegiance to the new English monarchs, William and Mary. You’ve also seen these memorable vistas in several movies including, "Harry Potter and the Prisoner of Azkaban," "Skyfall," and "Braveheart." We lodged at St. Andrews Guest House near Fort William’s city center. Once an old 1880s choir school, this stone mansion has been converted into a family-run, six-room bed and breakfast. During the evening, we dined at one pub and drank at another just a few blocks from this cozy castle—no driving needed. We met a group of nearly incomprehensible Scottish blokes, sampled some local beers, and slept off our jet lag. Glenfinnan Viaduct, where the Hogwarts Express flies by. We took a boat to the Isle of Skye on Day 2, and drove directly to the Fairy Pools. (By “directly,” I mean we missed the small sign, got lost, and had to ask an old Scottish man on the side of the road where to go.) The pools are beautiful crystal blue watering holes and waterfalls surrounded by ice-capped mountains. That evening, we had fresh seafood and cheap Talisker whiskey at a restaurant in Portree. 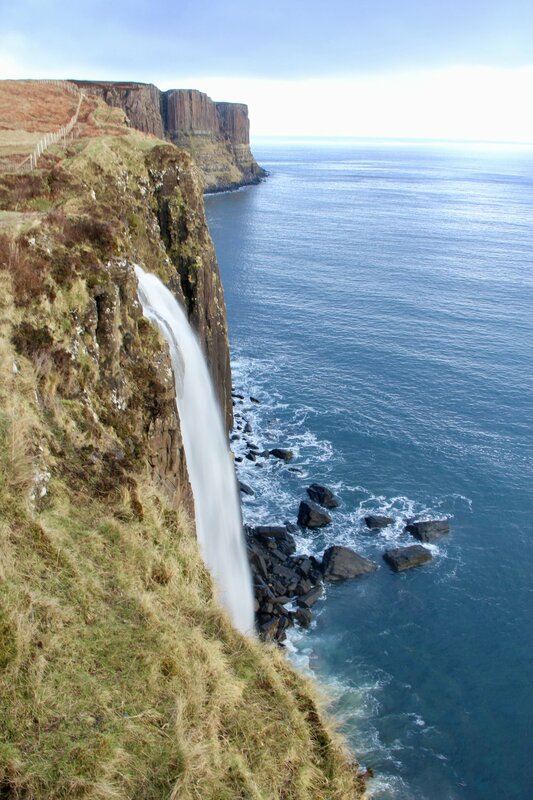 On Day 3 we drove by the Old Man of Storr, took pictures of Kilt Rock, and did a 6-hour hike through the Quiraing. This was by far one of the most beautiful places I’ve seen on earth—but we got quite lost when the fog rolled in. I would suggest purchasing a map since there’s almost no cell service on the island. Read more about the Quiraing walk here. Our Airbnb was located outside of Portree at this contemporary Scottish cottage. The house was beautiful, had strong wifi, and would have fit up to six travelers. However, you are out in the middle of nowhere, so prepare for the night before leaving town! Taking the (unexpected) ferry to the Isle of Skye in the Scottish Highlands. After our long Quiraing hike, we hopped in the car and drove toward Inverness, a town near the famous Loch Ness. On the way we took pictures of Skye’s incredible views and Eilean Donan Castle. Before heading to our B&B for the night, we stopped at the Highland Riding Centre and took a quick horseback ride to a viewpoint of Loch Ness and Urquhart Castle. That evening we found traditional live music at a pub, and enjoyed walking through the city streets. Inverness has been dubbed the capital of the Highlands, and still maintains strong connections to the Gaelic language. It's also well-known in pop culture: Inverness has ties to Shakespeare's famous tragedy, "Macbeth," and is featured in "Outlander," a popular book series by Diana Gabaldon. On Day 4, we drove back to Loch Ness so we could explore Urquhart Castle on foot (and look for the infamous monster lurking in the deep lake). Then we headed south toward the vacation town of Aviemore where we boarded an old steam train for lunch and tea. After our meal, we drove to Dalwhinnie Distillery for an excellent Single Malt Scotch Whiskey tour and tasting. Finally, we continued on to Glasgow where we would spend our last evening in Scotland. Buchanan Street, Argyle Street, and the boho West End are all popular destinations within this bustling city. We walked through the University of Glasgow over to Ashton Lane for dinner and cocktails. If you are looking for traditional live music, check out Ben Nevis, the Lismore, or Wintersgills depending on the night. When we were in town on a Tuesday, Wintersgills was hosting a live folk music session in their back room—and it was a highlight of our trip. We were the only tourists in the pub, and heard some fascinating songs and stories. We opted for the Argyll Hotel, a family-run lodging in a traditional Georgian building near city centre. Parking was a bit difficult because we arrived during rush hour, but since we were so close to busy streets full of cafes and shops, we didn’t need to use the car again until it was time to go to the airport. We also got an upgraded room when we arrived due to a cancellation. Glasgow is Scotland’s largest city and cultural hub: The national opera, ballet, theatre, and orchestra are all based here, as well as a large selection of museums and libraries. Artists like Belle and Sebastian, Camera Obscura, Franz Ferdinand, Mogwai, and Chvrches have also boosted the active Glasgow music scene. On Day 5, we had a quick breakfast and headed to the airport. All of us were bummed to leave this beautiful country and swore to return to see the Eastern portion of Scotland soon. I hope this guide helps you plan your own journey—if you have any questions, feel free to sound off below! Sign up with your email address to get blog updates!